Ask leaders what the keys to growth will be in the coming years and hear the words innovation and creativity ring out. But ask colleagues who is best suited for leadership and find few creative thinkers considered. The curious case of creativity in leadership is described by the study's lead author, Jennifer Mueller, to CNN, like this: "I walk into a meeting and someone voices a creative idea and someone else rolls their eyes and says 'that's the creative over there,'" [said Mueller, who is an assistant professor of management at Wharton]. 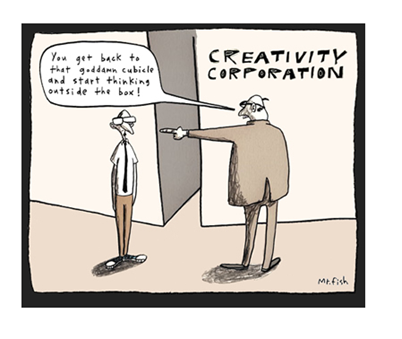 "Yet if you were to say, 'Do you want a creative leader?' They would say, 'Of course!'" What's going on? Why can people see the value of creativity in leadership, yet continue to perceive creative leaders negatively? It's a problem of expectations, the study says, biases we have about what we think a leader is. To use an analogy cited in the study, if the most salient feature of a bird is the ability to fly, then birds that fly can be easily banked into the bird column. But birds that can't fly, well, it's harder and takes more time to categorize them correctly as birds. Perhaps the same mental friction is going on with how we think about leadership. The prototypical leader, the study says, is someone who excels at organizing, coordinating groups, promoting order, diminishing uncertainty, creating shared goals. The leader conforms to group norms and reinforces a collective identity. The creative thinker, though, is someone who doesn't readily conform to this existing mold of leadership. Creativity is associated with things like uncertainty, nonconformity, unorthodoxy and unconventionality, according to research. So finding a way to break down preconceived notions about what a leader is has been a challenge. Talking about what makes a good leader, out in the open, is a good way to begin to alter these perceptions, said Mueller. "Corporations should be really careful about their performance appraisals system and how they identify leadership. If they really want to have creative leadership, it's going to take more time and effort to nurture," she said. By understanding the traits of creative people and bringing that knowledge into discussions about effective leadership, with time, the old stereotypes will start to fade away.